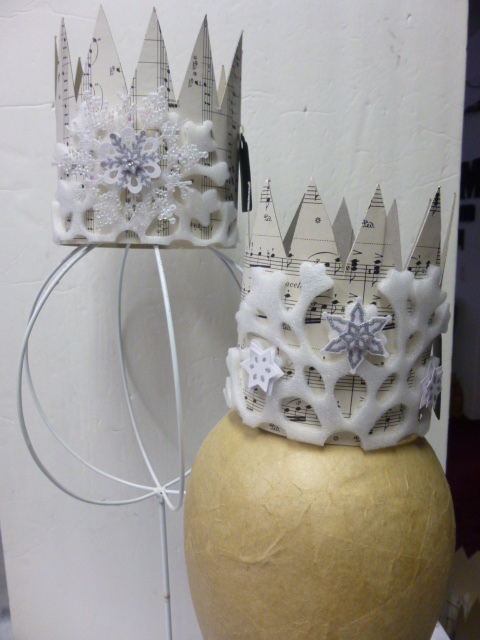 Just ‘using what I have’ this year as far as supplies ans embellishments go. It feels pretty good to pare down my stash a bit! 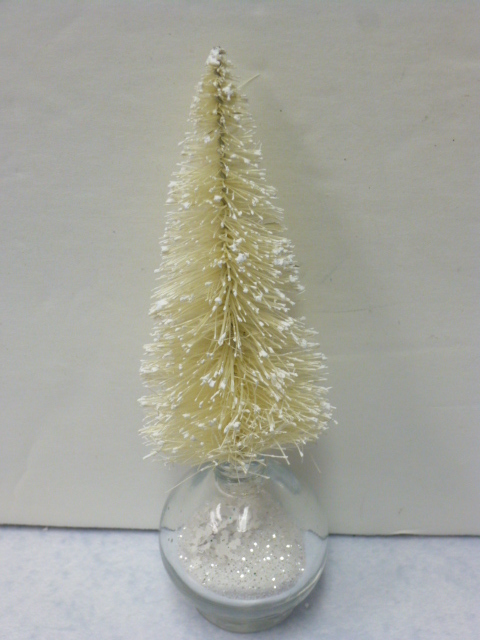 Glued a little white tree that I covered with Mica flakes to the top, a sheer bow and a small metal snowflake ornament. 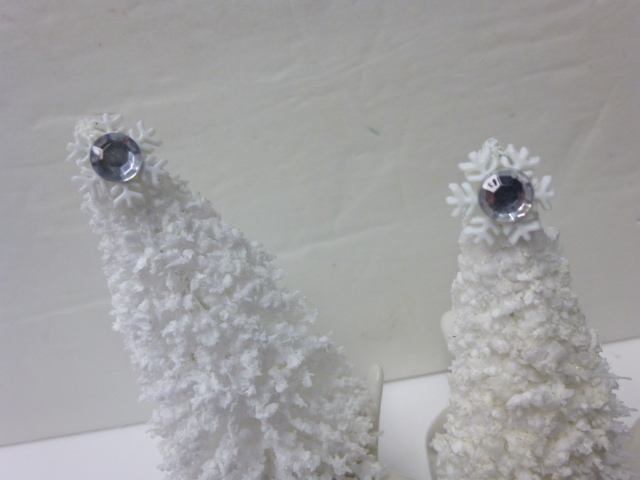 On top is a tiny snowflake BUTTON with a clear rhinestone glued to the center. 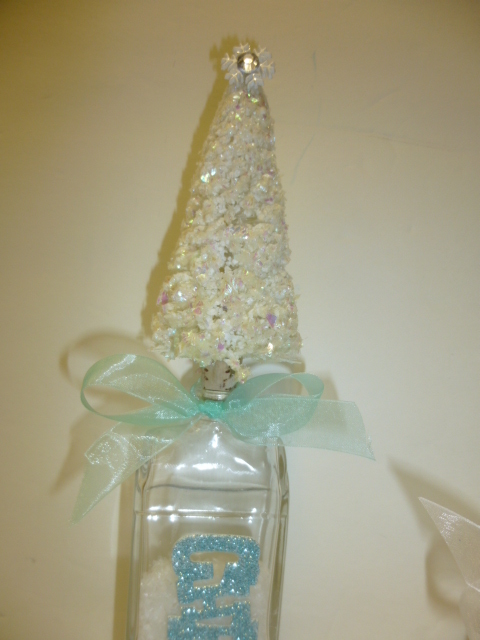 On this tall bottle, I glued a ‘CHEER” label to the front and tied and aqua bow around the neck. Similar (but BIGGER) tree glued to the top of this one. 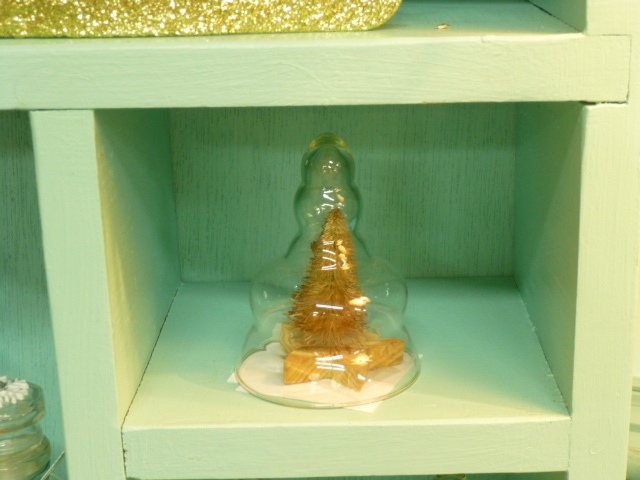 This one had a cork, so I took the base off the tree and screwed the tree into the cork; unscrewed it, put a dot of glue ion the hole and screwed it back in. The previous bottle had a bigger opening and rim and no cork. so I glued it with the base still on. This one is a triangle shaped bottle, small opening but good sized rim. Blued this little bottle brush tree directly onto the opening. 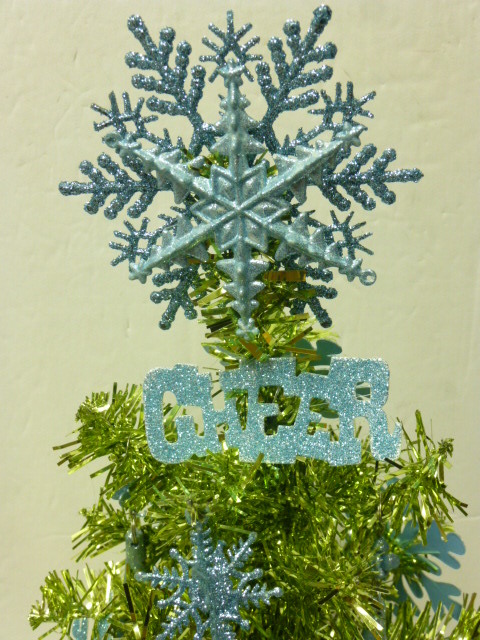 Glued the JOY embellishment on and added a larger snowflake button to it. 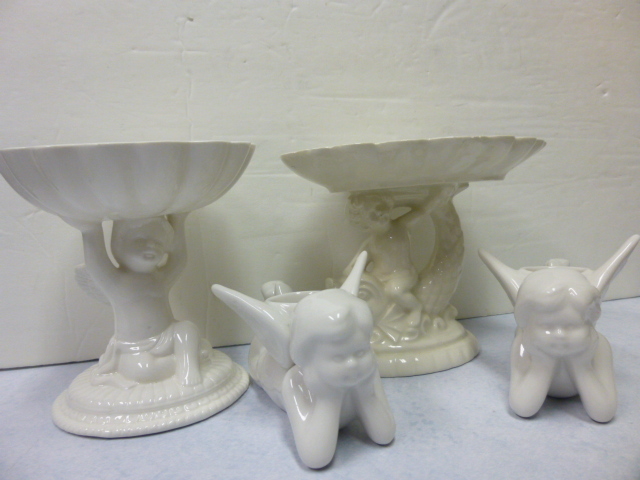 These will be going to my booth at Stars Antique Mall soon. I had some big spools, small spools and the tiny new ones. 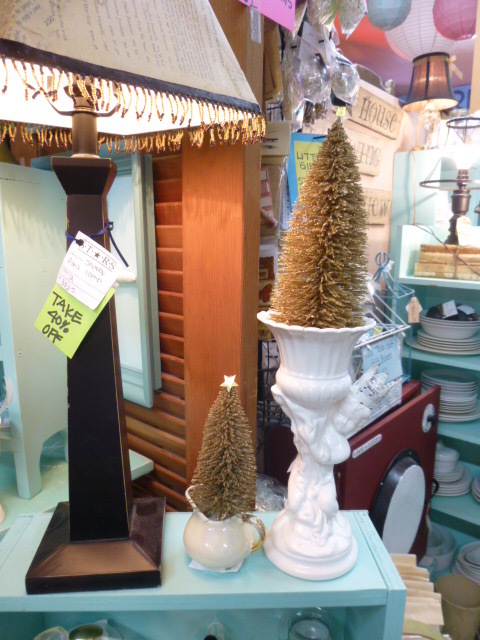 Since they were all ‘neutral tones’ I used my cream colored trees on them. 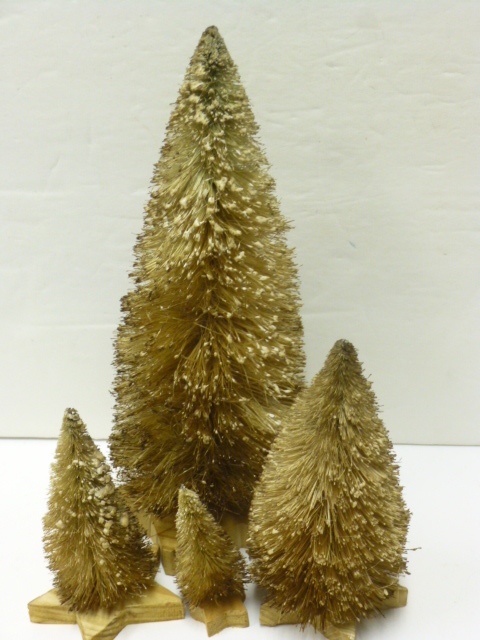 These are the trees that I bought already this bleached looking color. 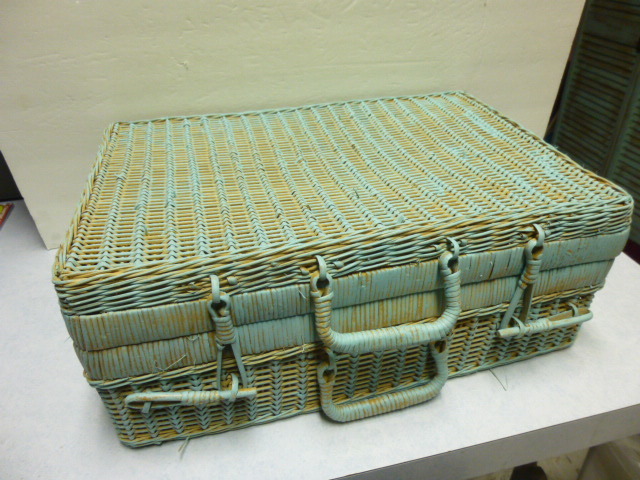 So it was a pretty quick and easy project! 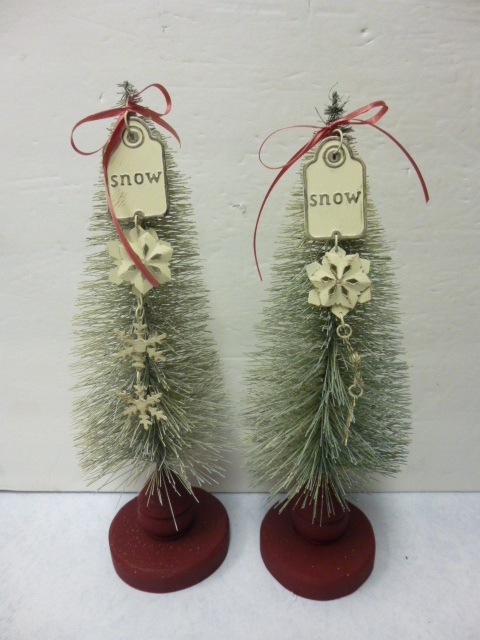 Just a bit of tacky glue on the bottom of each tree, and plop it onto a spool! I’ve also seen people take whole groups of tress like this and glue them to a vintage silver tray and cover it with fake snow OR pretty vintage glass balls. But I didn’t really have enough trees to use so many of them in one big project. 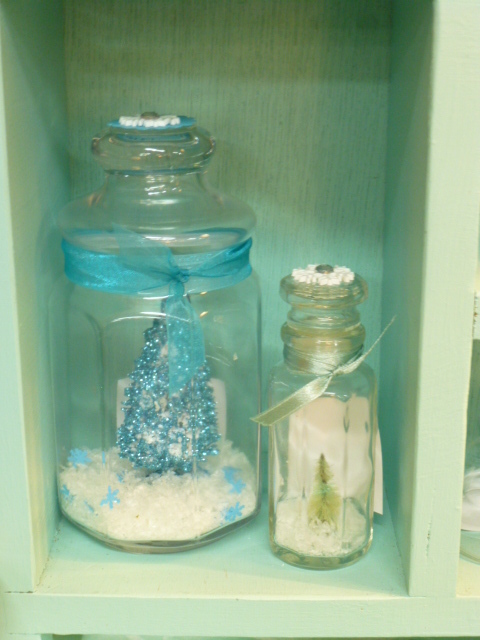 I also had two of these little jars I got at the thrift store. Looks like maybe they were originally filled with fragrance oil for a reed diffuser set maybe. There is a picture on the INSIDE BACK of the bottle as well as the front. Kinda neat looking. Hard to photograph though! 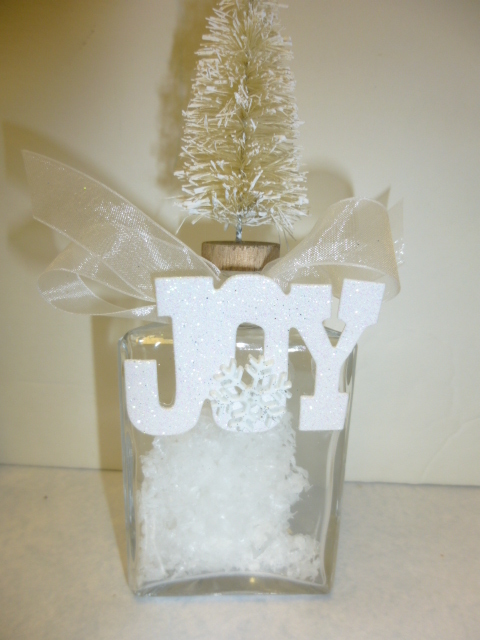 So I filled these part way with some fake snow and glued a tree on top. 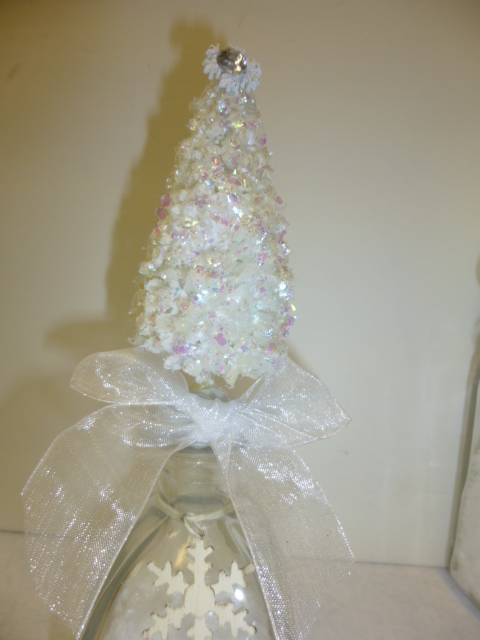 The trees were a perfect fit for the bottle top! I took pairs of the tiniest trees and bagged them to sell. Tiny things like that have a way of disappearing sometimes, not to mention how difficult it is to put a price tag on something that small! 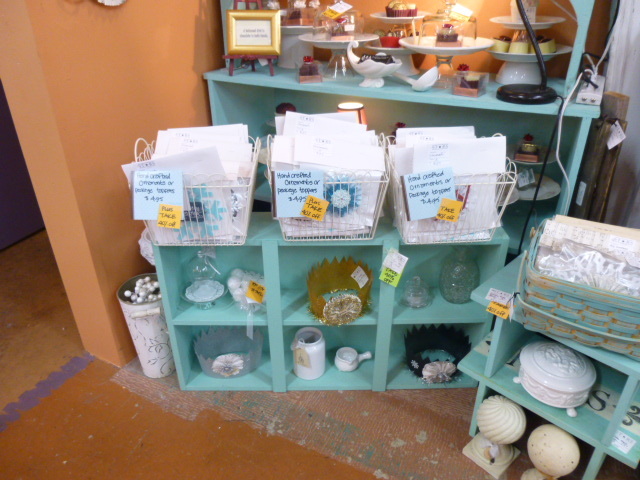 And this is how I displayed the rest of them in my booth at Stars. I also had a few bigger trees leftover from last year. These are ones that I had bleached, then tea stained and added new star shaped wood bases to. Just something ‘different’ that you don’t see everywhere! 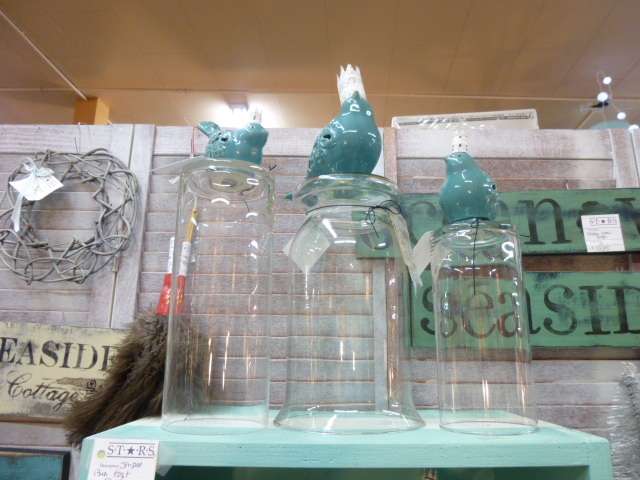 Put some under little glass cloches. Displayed some with other things, here and there. Next to a tiny crystal angel here. 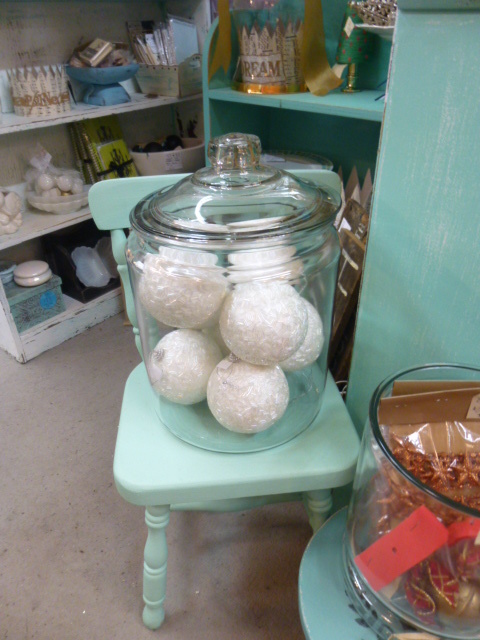 And with some jars full of glass balls here. 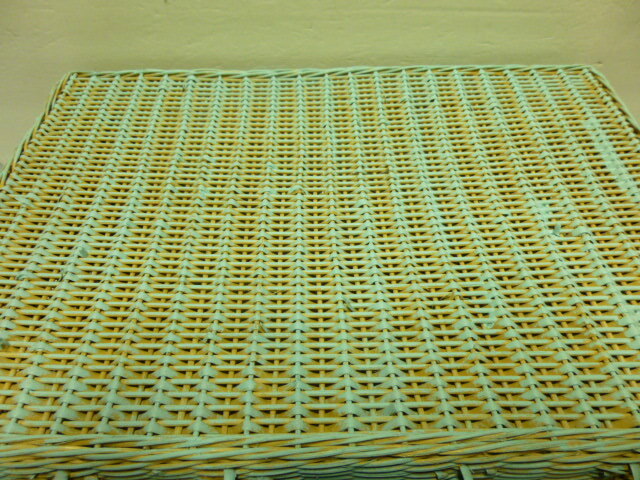 I just LOVE those neutral colors against the aqua background! I hope you are enjoying the holidays at your house!! Still MORE crafting pictures . . . 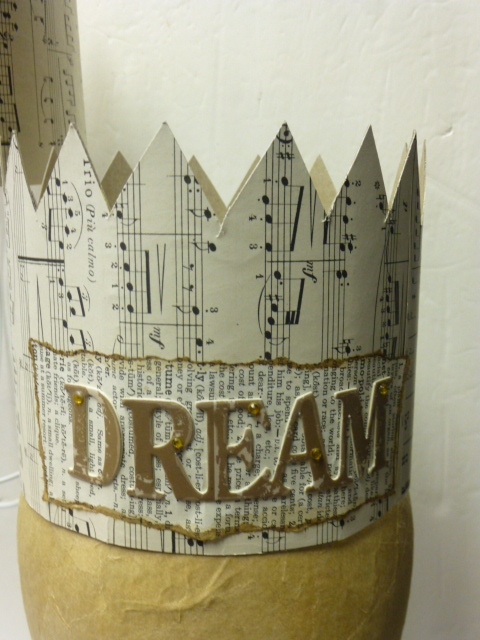 I TOLD you I had been doing a LOT of crafting!! 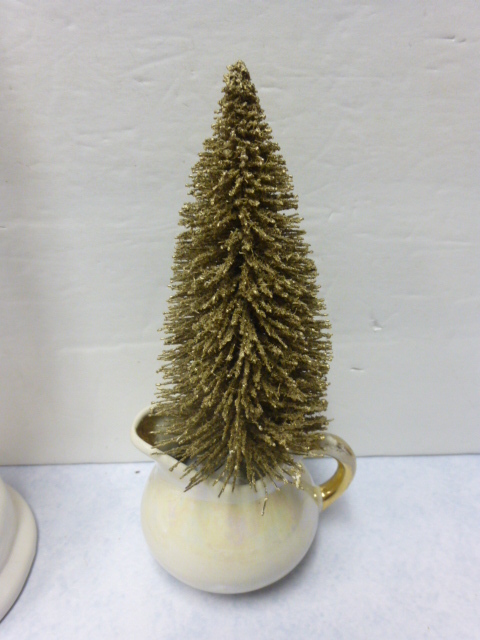 Dollar Tree bottle brush trees from MANY years ago. (I find all kinds of good stuff when I sort through old boxes that I had stashed!) 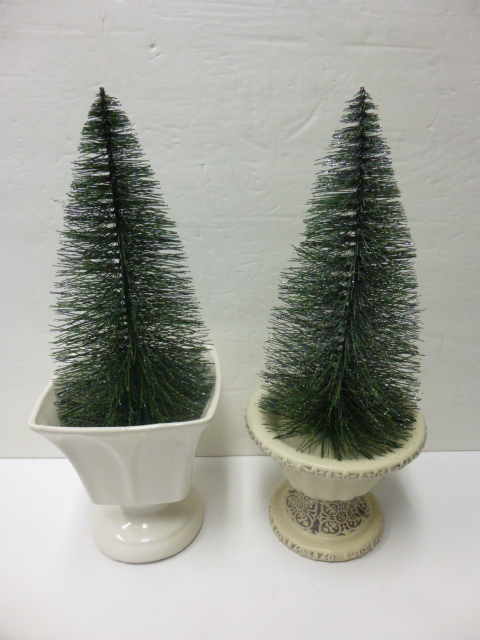 These were nice ‘trees’ with UGLY plastic flower pots filled with styro for bases. I removed and tossed the bases immediately. These trees I spray painted white, that was as far as I got ‘back then’. Added new wood bases painted red and metal ‘snow’ tags. For sale in my booth at Stars. 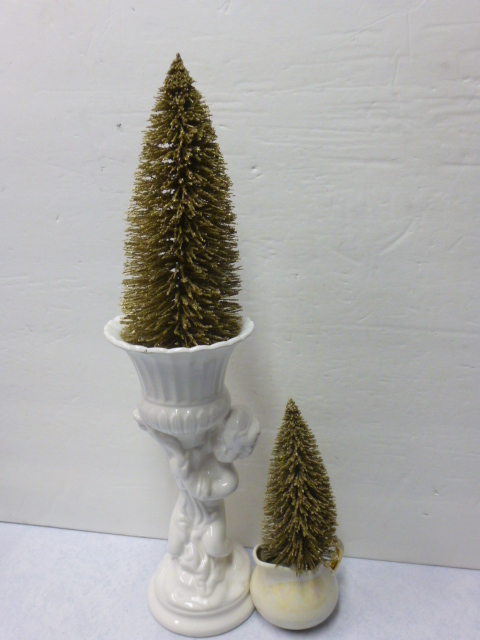 A couple more of those DT bottle brush trees, about 11″ tall. 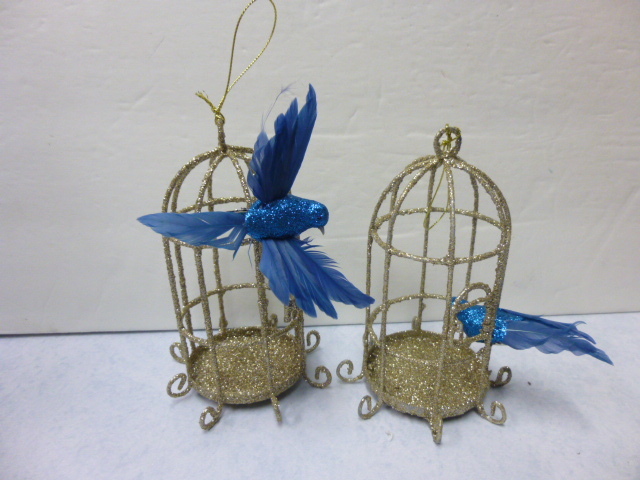 These I just left their original color, and you can’t see it at ALL in the picture, but they are ‘glittery’. 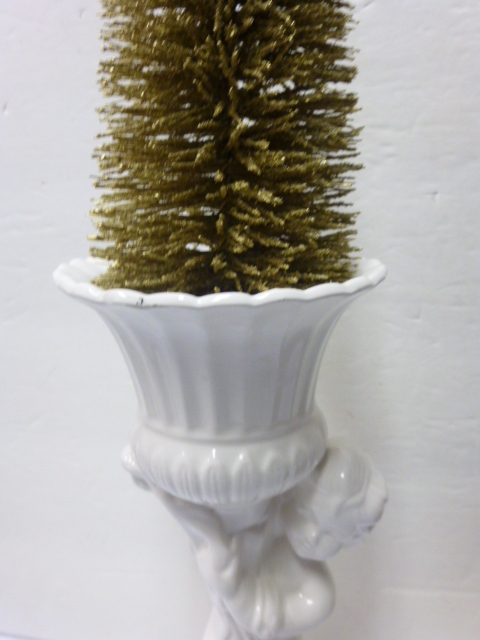 It doesn’t have glitter ON it, rather the bristles just glimmer. I WISH I knew how to get that effect. It just came that way. For sale in my booth at Stars. You can almost see the glimmer in this picture! Look at the very tips. So this one I put into a vintage white vase. Stuffed some of the soft ‘popcorn peanuts’ in the bottom with glue to hold it into place. Topped with more glue; then ‘screwed’ the tree into place. 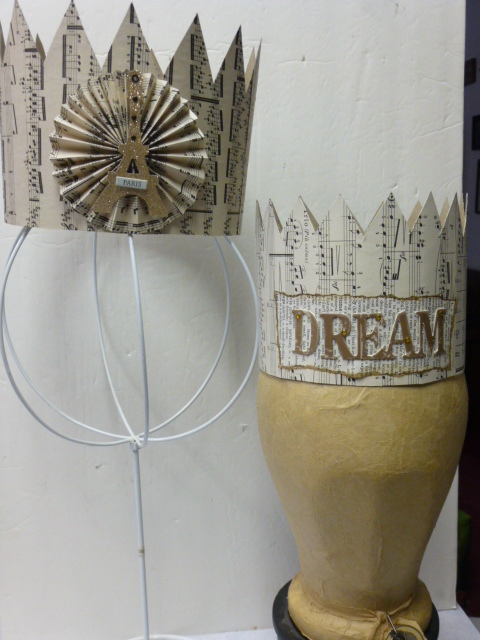 Decided to leave these two unadorned. 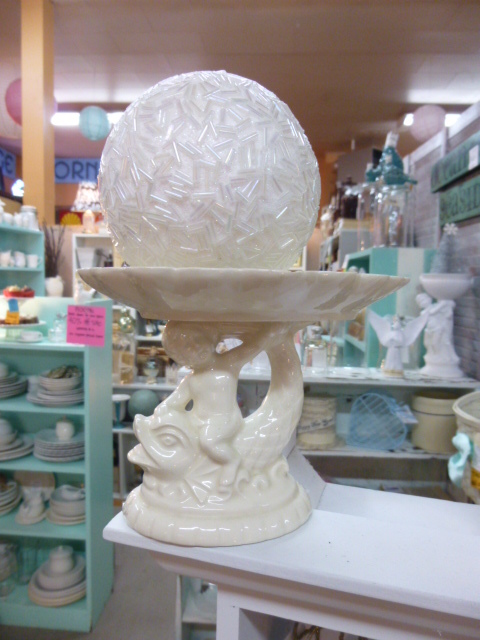 This one I put into a vintage taper candle holder. I ‘thought’ it was going to be easier, with the smaller hole to fill and all; just needed a couple of peanuts for this one. 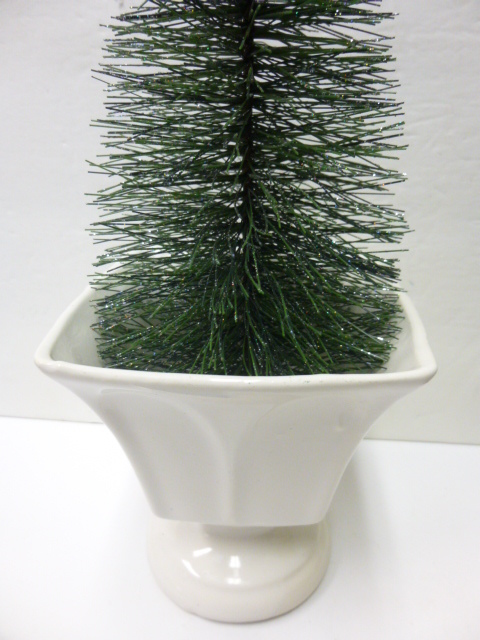 But it was such a short hole that I had to trim the wire stem on my tree to fit and now the tree likes to LEAN a bit! Live and learn! These were a couple of trees I bought new at Wal-Mart this year, just to test and see if the color would bleach out of them like YOU can with many of the other bottle brush trees. Nope, they didn’t bleach out all the way. Just enough to leave them looking like the bush the dog pee’d on! sheesh! So I spray painted them a burnished gold. For sale in my booth at Stars. 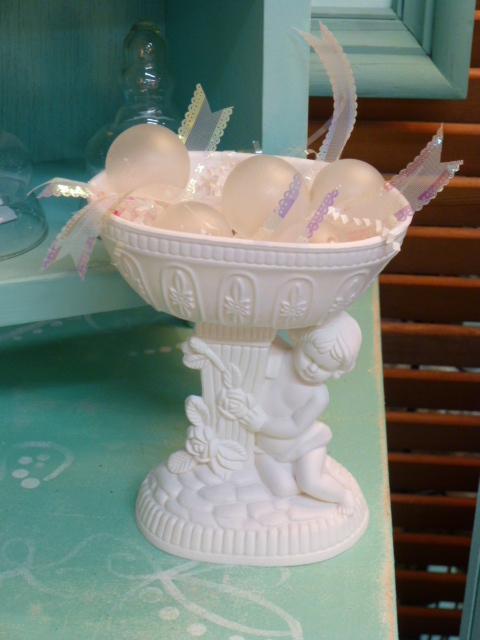 I had been saving this vintage cherub vase to make into a cake stand. 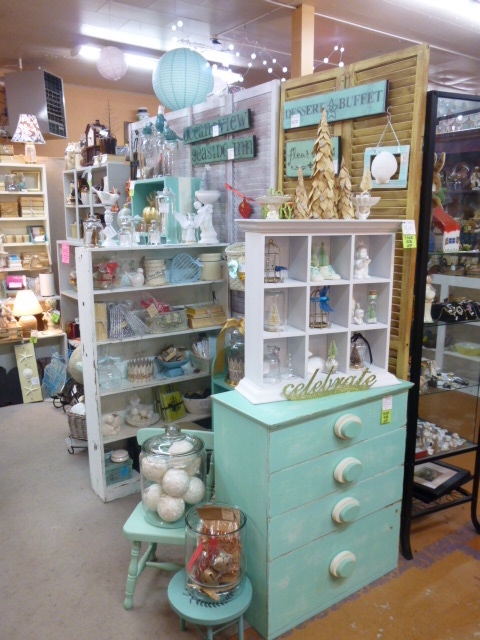 Having a heck of a time finding the right color of white plate to match it. So I decided to use it for another tree. Same packing peanuts method on this one. 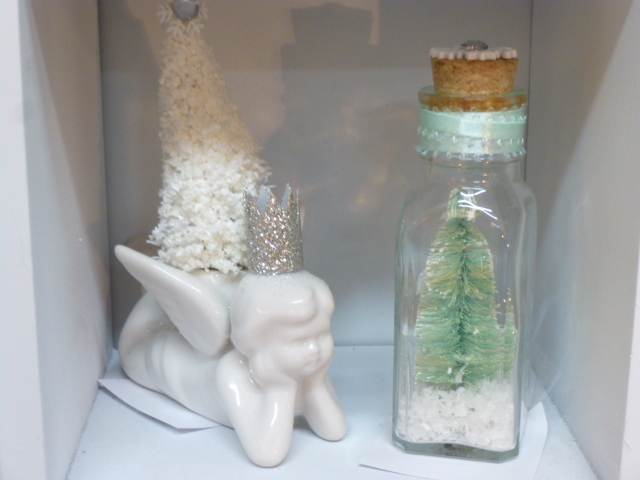 Then I moved on to some snow globe like things. 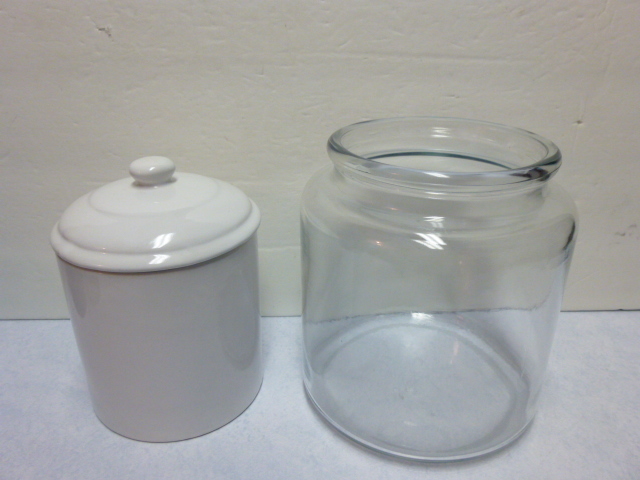 On the left an apothecary jar with lid, and on the right is an old jelly jar! For sale in my booth at Stars. 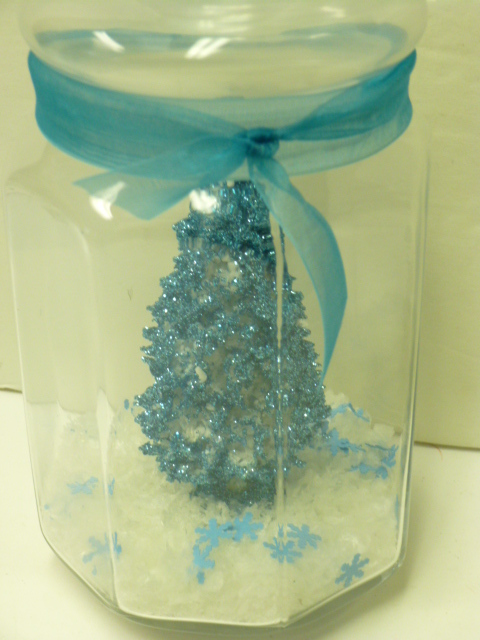 First I squirted glue all over the bottom of the jar, put my tree into place then added the snow; enough to cover the glue + a little more. 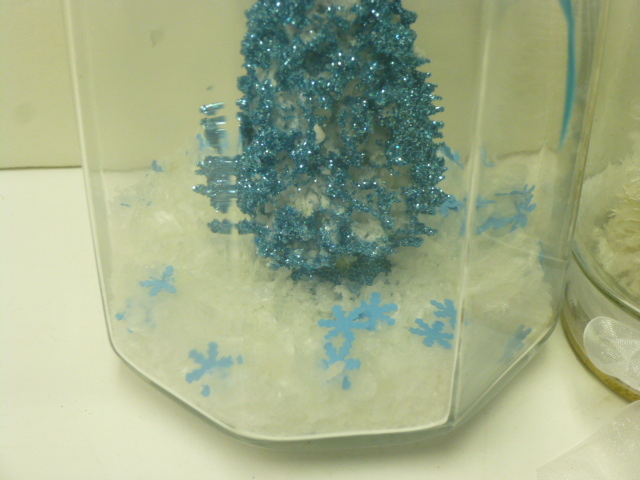 Then I punched some tiny turquoise paper snowflakes and tossed them in. Grabbed some matching sheer ribbon to tie around the neck. 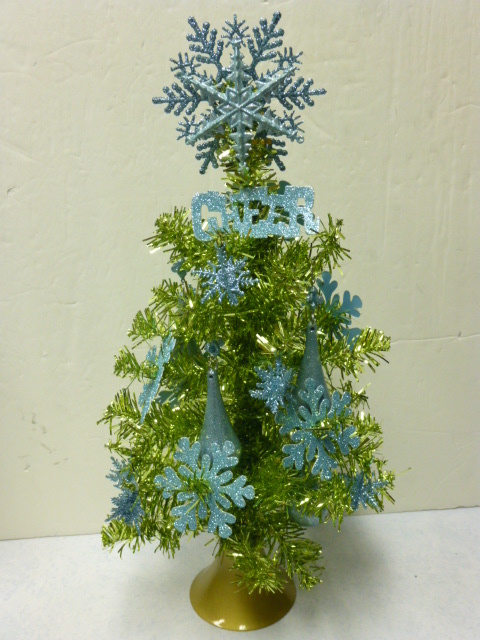 Oh, this was a flocked white brush tree from Dollar Tree, the ones for the Christmas villages. 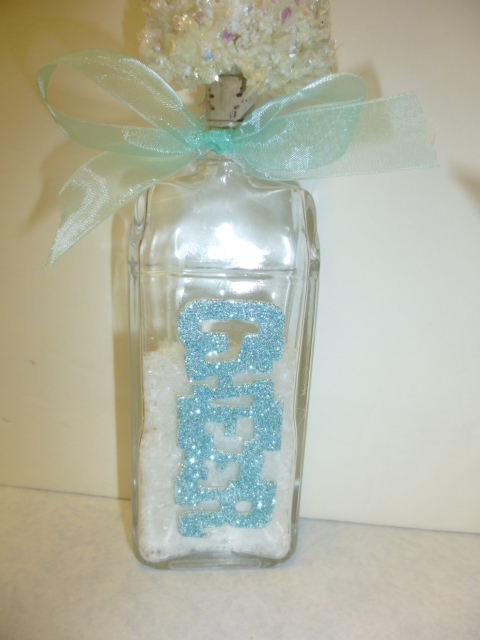 I added the turquoise glitter. This tree came this way, in a multi pack from Michael’s. 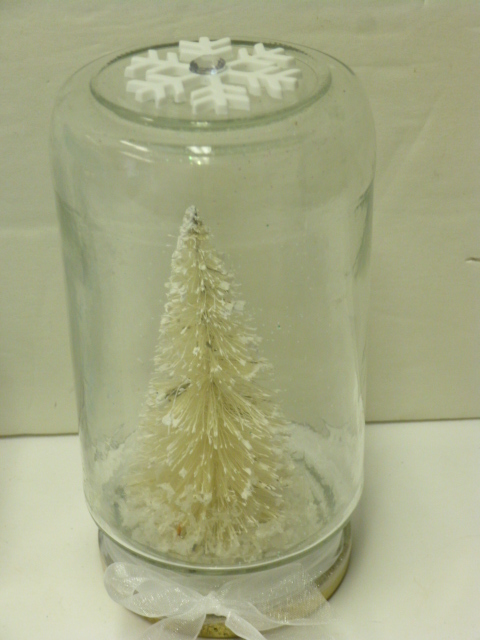 Glued the tree to the LID of the old jelly jar, then added glue all around the rest of the inside of the lid. 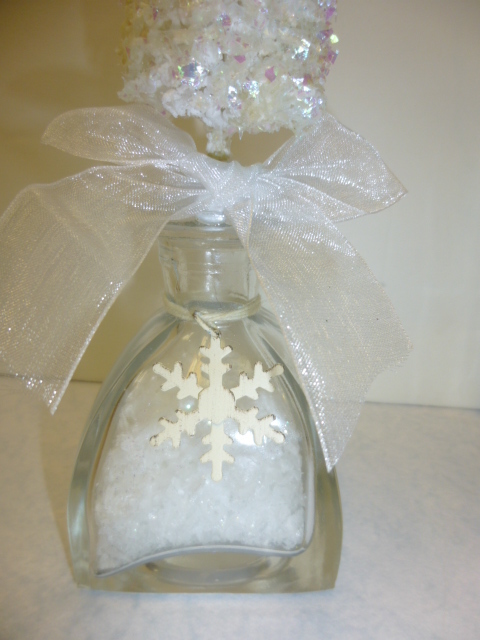 Pour snow into the JAR, then screw on the lid, keeping the jar upright so you don’t have a snow flurry on your craft table! Toe some ribbon around the neck of the jar. I added some glue to the rim of the jar to hold the lid into place, lest curios minds with sticky little fingers decide to ‘see how it works’ while mom isn’t watching them at Stars! Decided the inverted jar needed ‘something’ on the top. A plastic snowflake button with a gem in the middle did the trick. Decided the apothecary jar needed one too! This is another one of the old DT bottle brush trees. Came already painted silver. I hadn’t noticed when I bought it, but it had a big chunk missing at the bottom on one side, so I couldn’t use it ‘as is’. So I just cut it down! 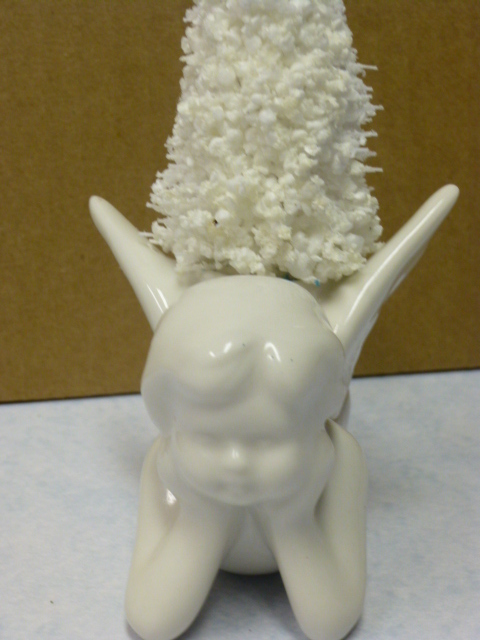 It fit perfectly in this vintage cherub vase. 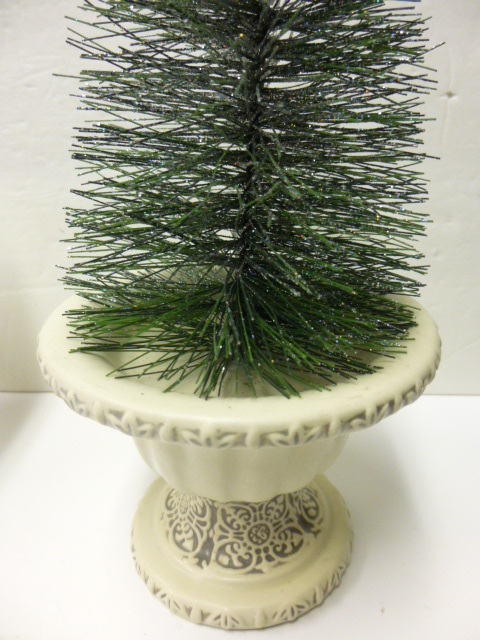 Since this tree didn’t have any stem beyond the bristles, I just glued it into the vase, no styro filler. 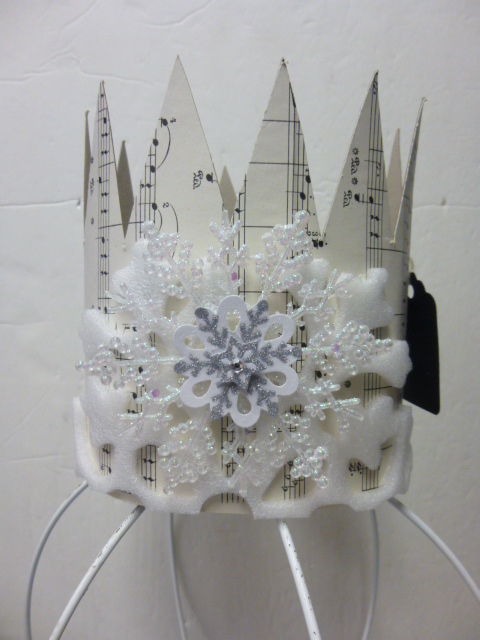 A silver crown for the cherub and DONE! For sale in my booth at Stars. 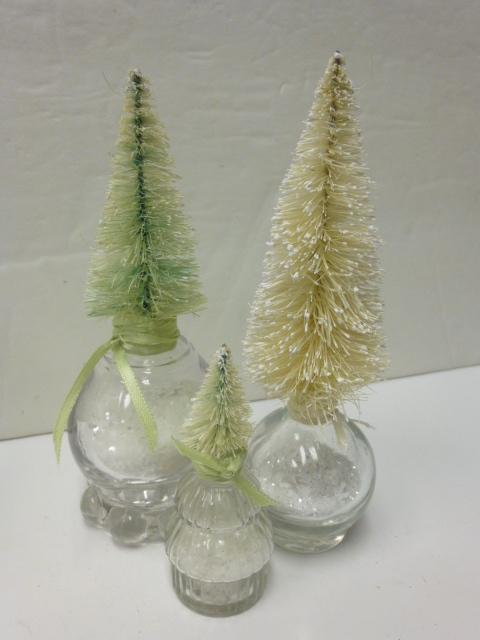 Then I did some ITTY BITTY bottle brush trees. Some of these trees are ‘as purchases’; others were bleached and dyed (will post about that in a separate post). 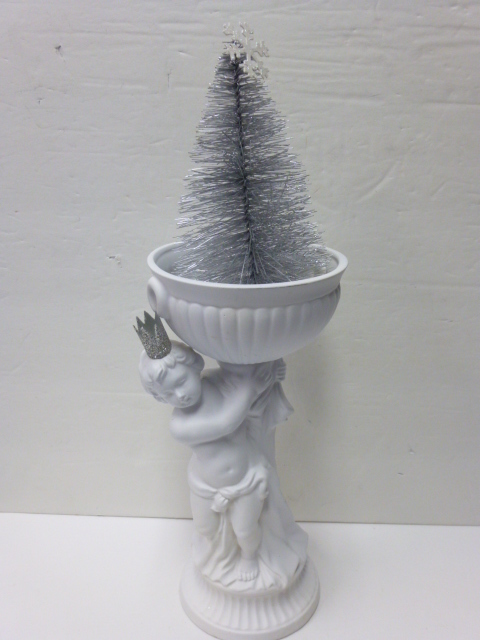 SUPPLIES FOR THIS PROJECT: This particular tree came from a multi-pack purchased at Michael’s, as is. 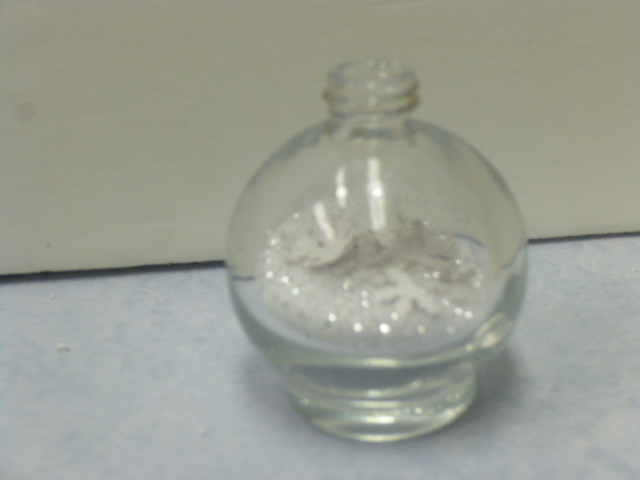 Some fine sparkly white glitter. 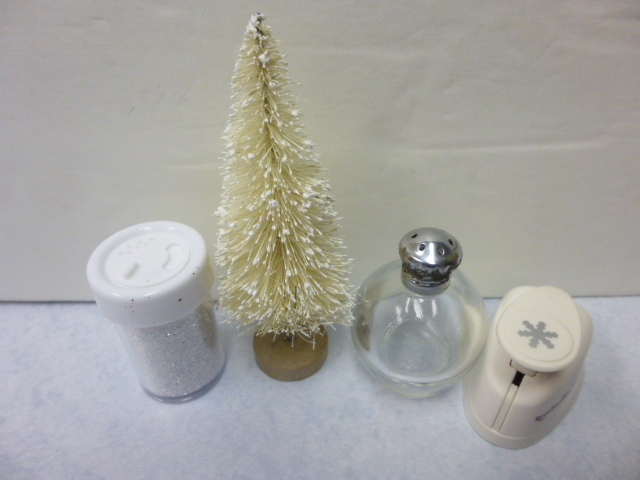 A tiny vintage salt shaker and a little snowflake paper punch. 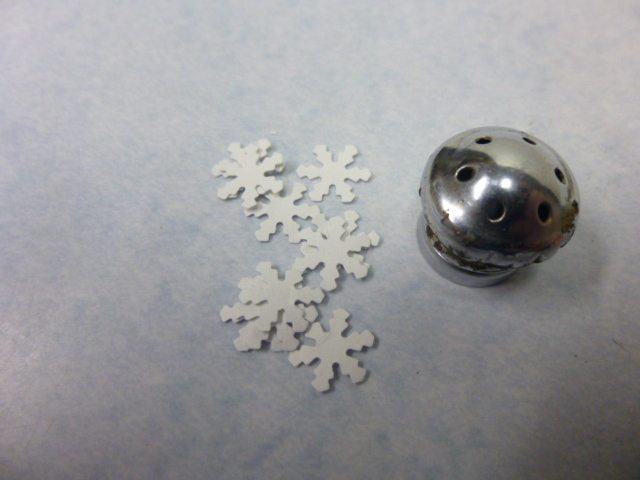 Punch some tiny white paper snowflakes. Remove salt shaker lid and toss it in your junk box for use on a different project some other time. Pour some glitter into your shaker. Then add snowflakes. 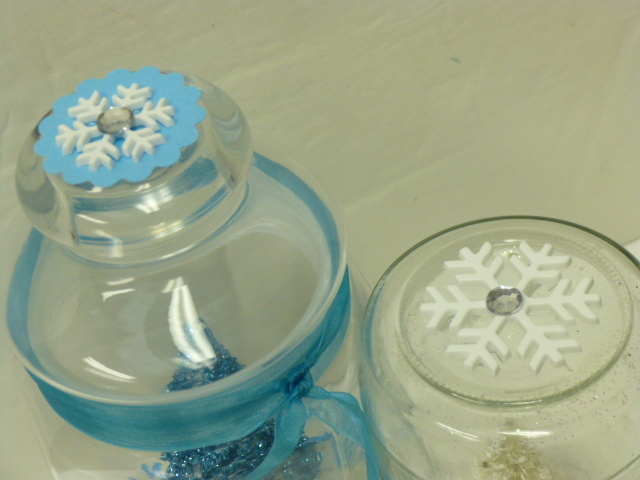 The snowflakes are a little bit bigger than the opening, and you want to be sure you don’t bend the snowflakes as you put them in. 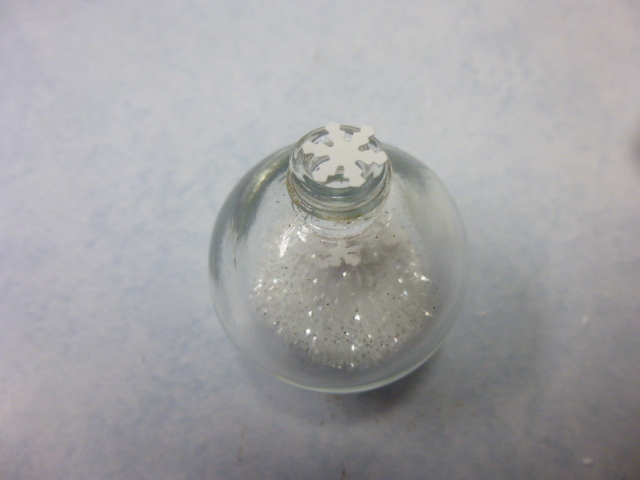 I set the snowflake over the hole like this . 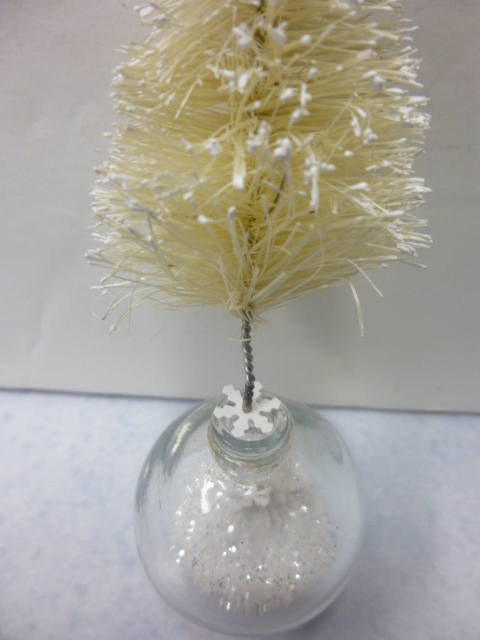 . .
Then used my tree (with the base removed) to gently push the snowflake down into the shaker. Can you see them in there??? 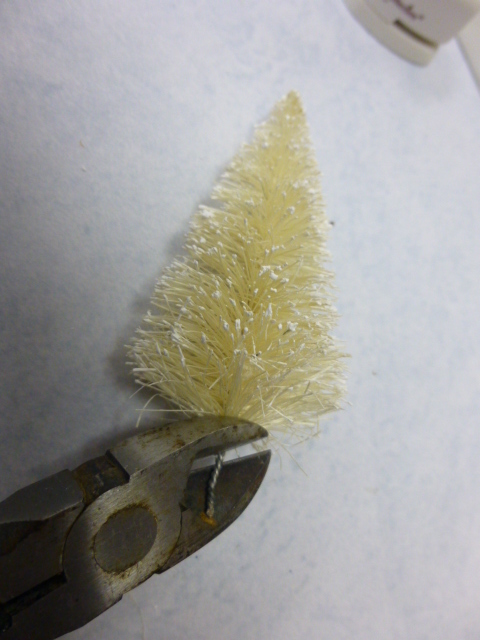 Then I snipped off all but about 1/2″ of the post. Leave just enough to fit into the neck of your bottle. 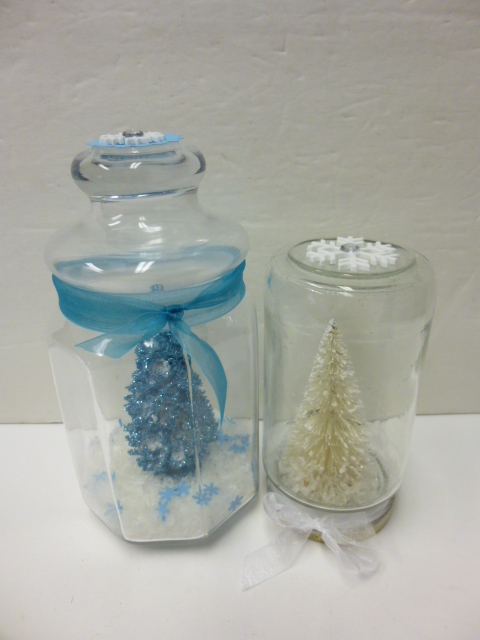 Glue and wrap some string around your tree base to make it big enough to fit snugly into the opening of your shaker. 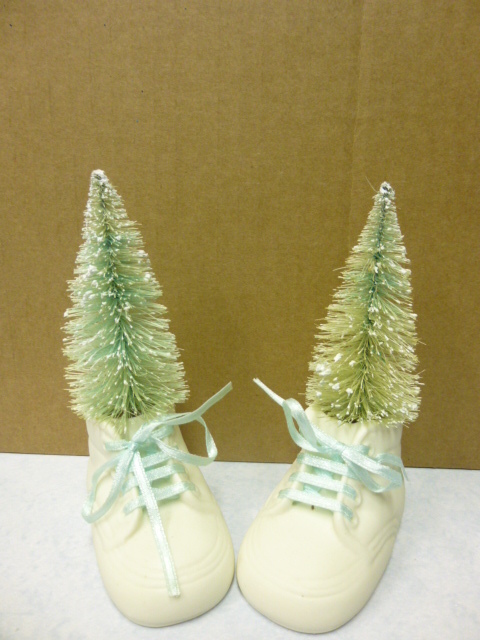 Run some glue around the inside rim and push your tree into place. Here are a few more, done the same way. Added a little ribbon around the neck as an afterthought. Would be cute to tie on a tiny tag also is you wanted. The pale green trees are ones that I bleached. 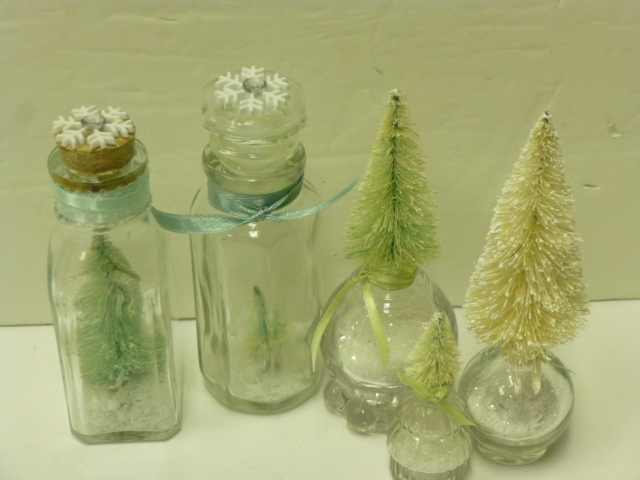 And some little spice bottles, using the same instructions as the apothecary jar one. GLUED these lids into place! I think these tiny ones are my favorites! For sale in my booth at Stars. 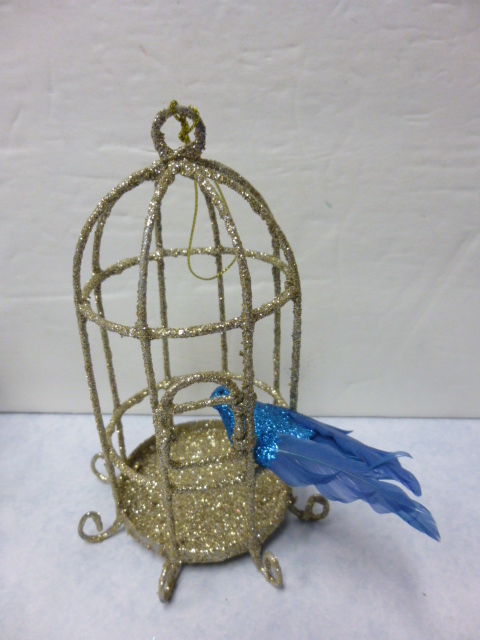 Little glittered wire bird-cage ornaments from Wal-Mart with clip on birds from Michael’s. For sale in my booth at Stars. 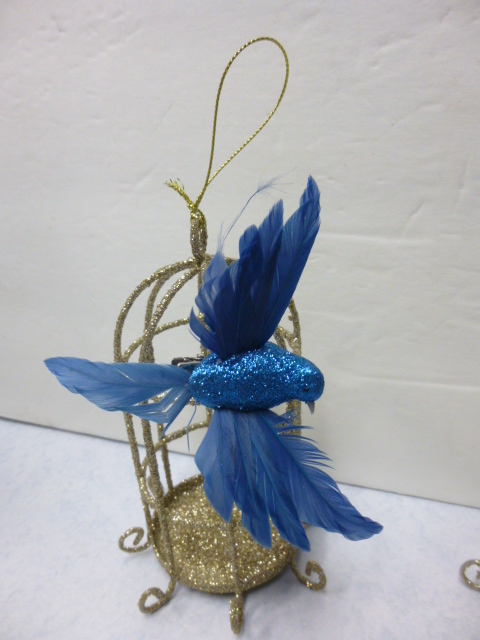 And one like this, with wings spread. More crafting . 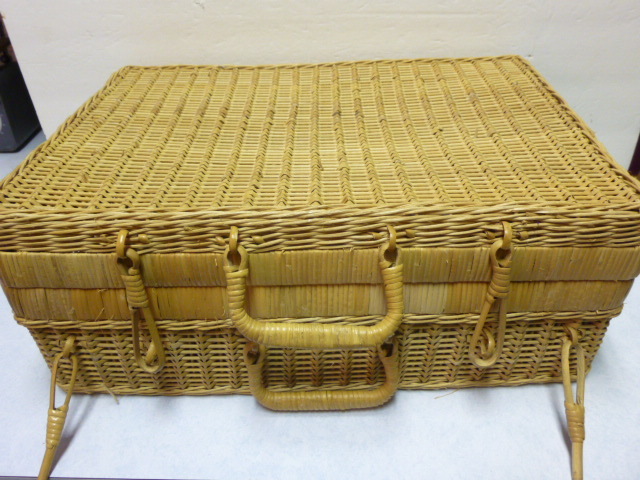 . .
Vintage wicker picnic basket, as found. And here after a ‘five minute dry brush paint job’! I LOVE dry brush painting! 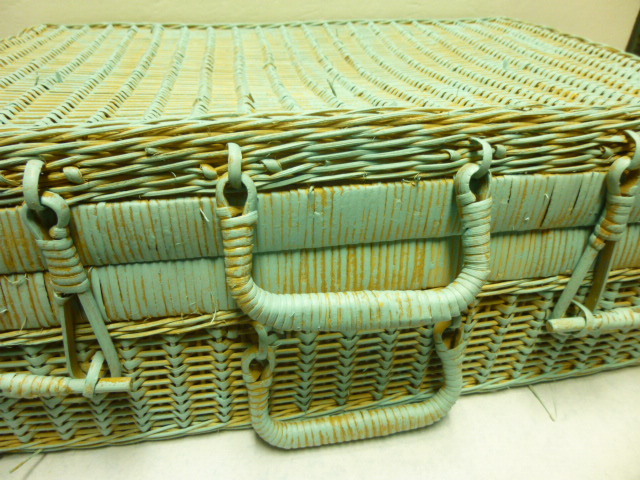 The latches and handles take a ‘little more time’ to work on, but STILL it’s a very fast process. You’ll find the instructions for dry brush painting under my FAQ’s category. I just might have to KEEP this one for myself! 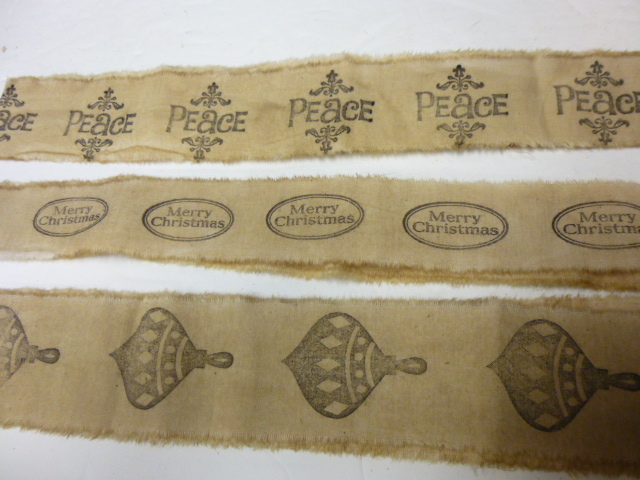 I just added some burlap ribbon (Hey Beth?!? Recognize this stuff???) 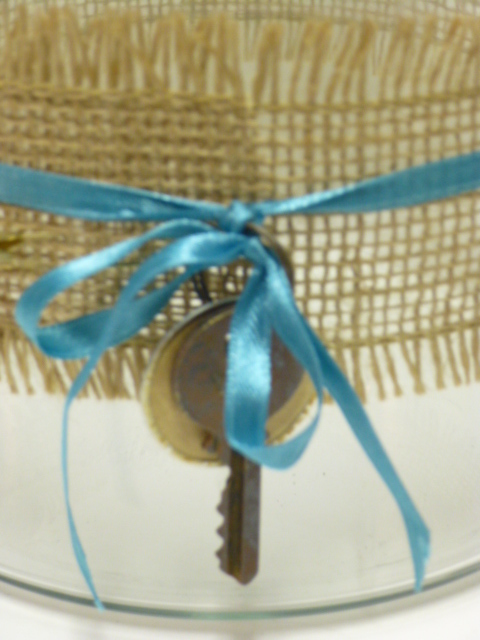 satin ribbon and old keys to dress it up a bit. 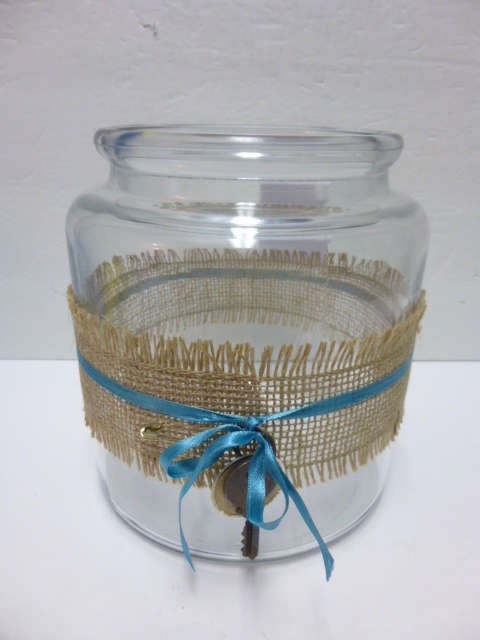 Big ole jars like this are very useful for displaying small stuff in my booth at Stars. 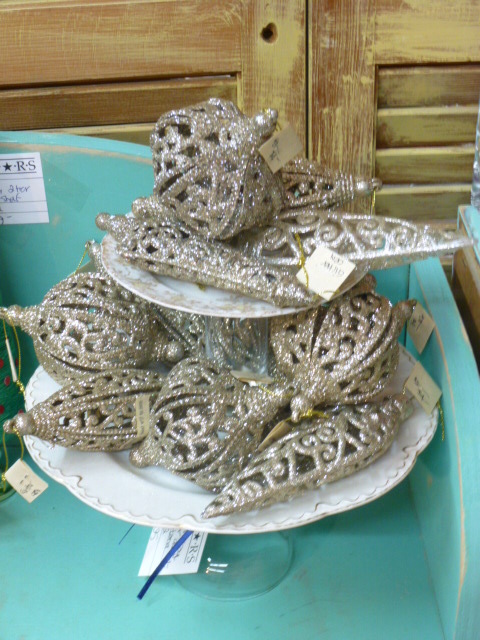 Cloches with metal shell on top. I’m not really sure WHAT these metal shell things were originally. 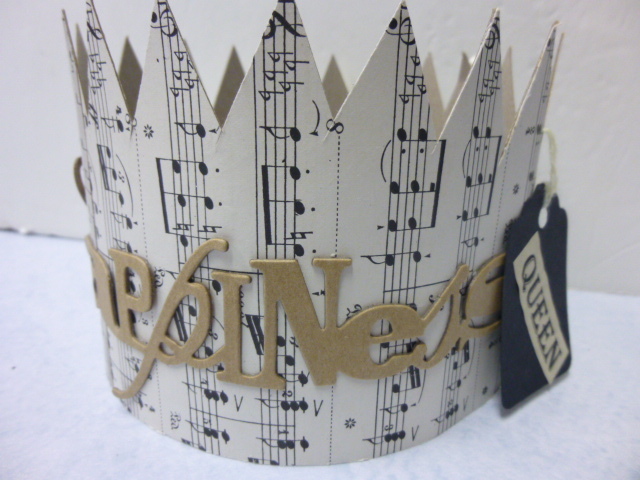 They are quite heavy, and have a ‘slit’ in the top, so maybe place card holders? 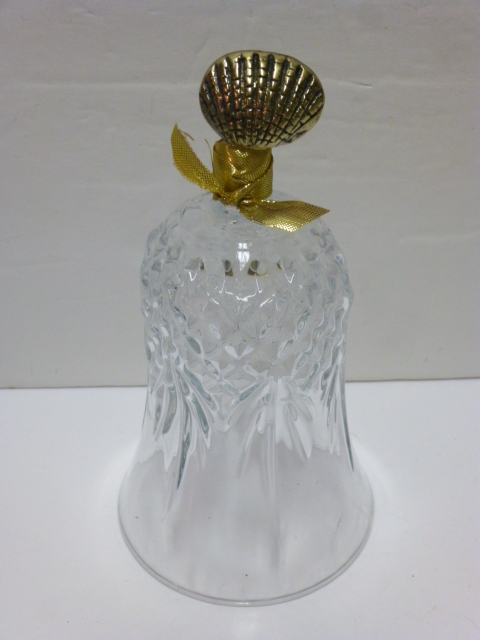 These cloches already had a little ‘stem’ , so I glued the knob on top of the stem, then wrapped the stem with ribbon. 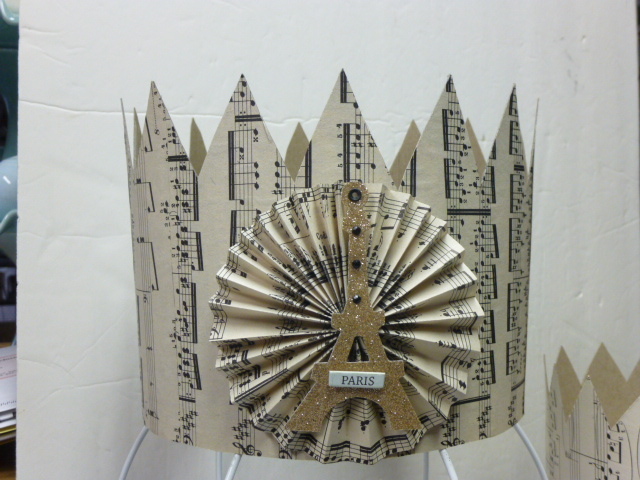 Making some ‘full size’ vintage sheet music crowns. This one is mine, and displays on the wire hat display in my living room. 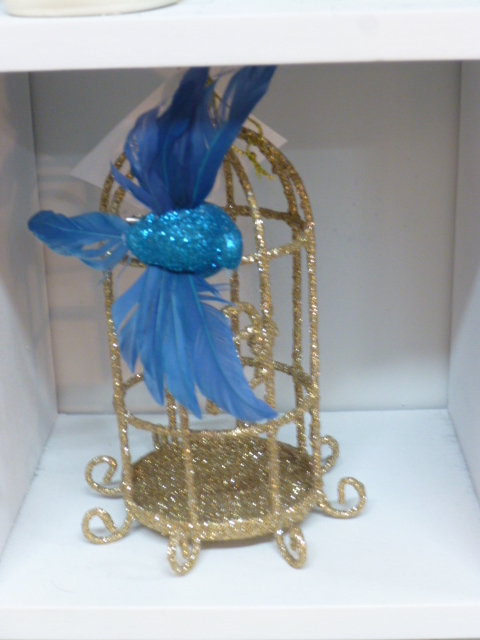 This one is for sale at Stars. 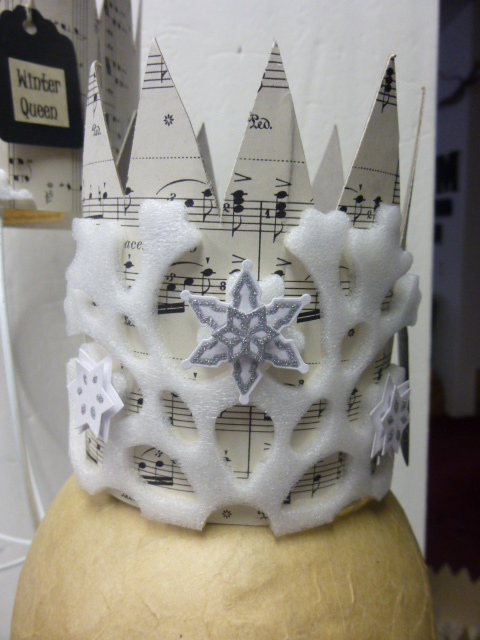 Slightly smaller ‘Winter Queen’ crowns are also for sale at Stars. 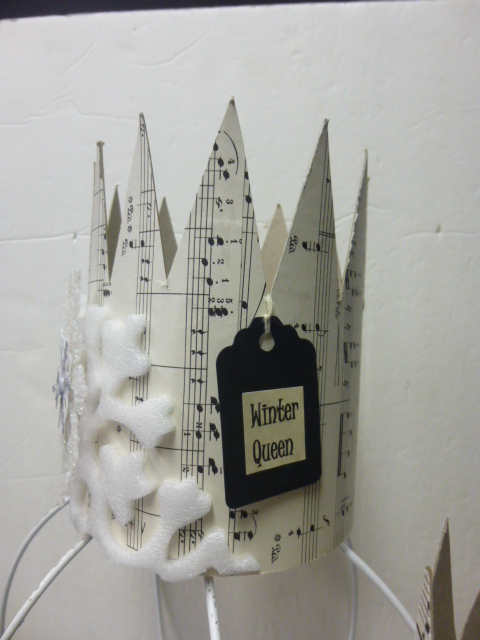 Winter Queen tag hangs slightly off to the side. 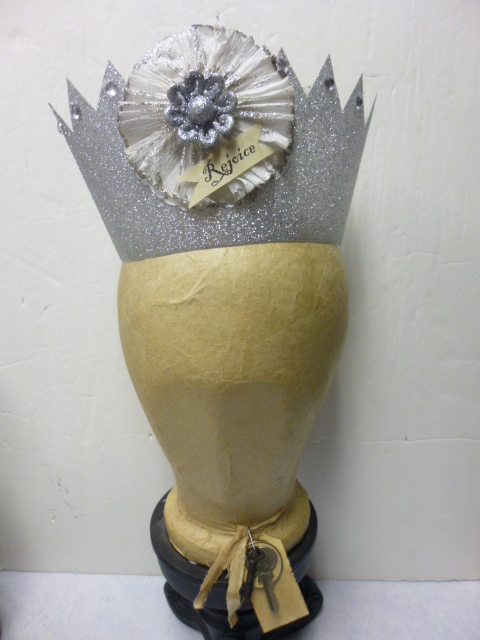 Happiness Queen crown for sale at Stars. 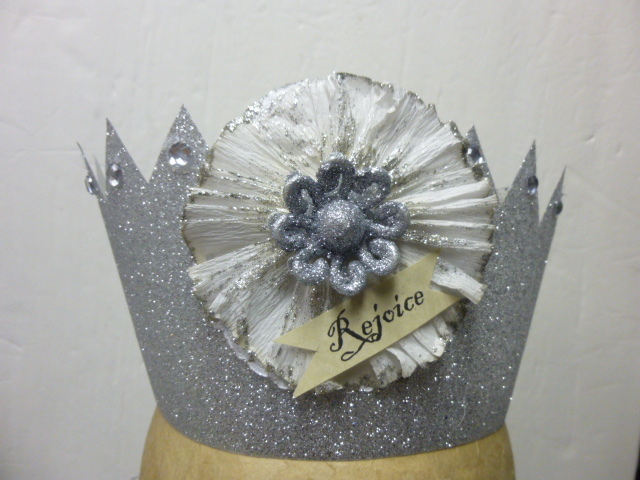 The plastic glittered crowns are ‘real’ size and for sale at Stars. 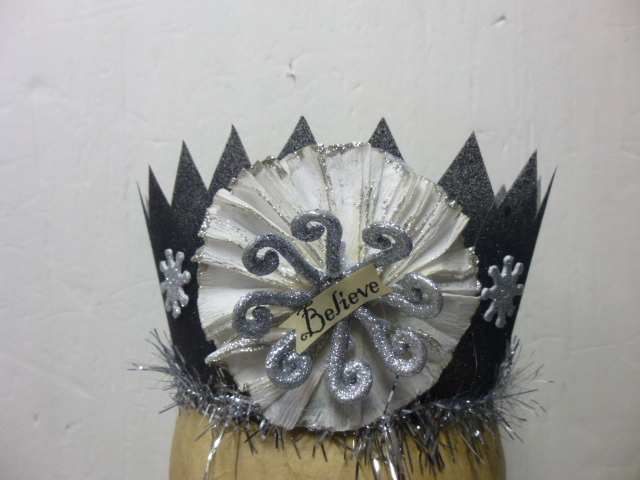 Black plastic glitter crown with silver tinsel trim. You probably already noticed these table top trees in the last pictures from Stars. These are just closer up views so you can see the decorations. 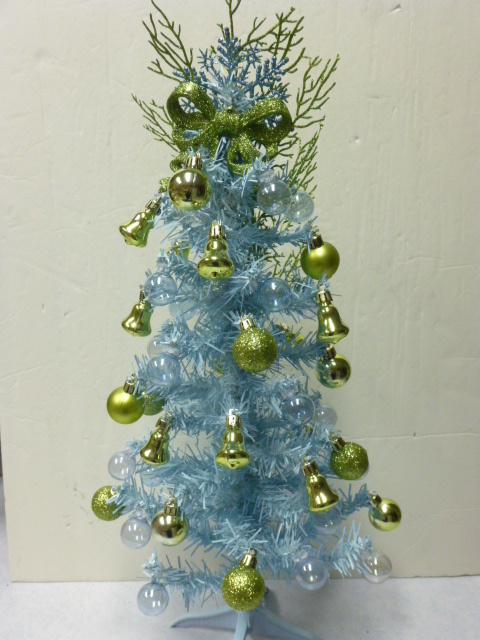 Lime green metallic tree with ice blue decorations. 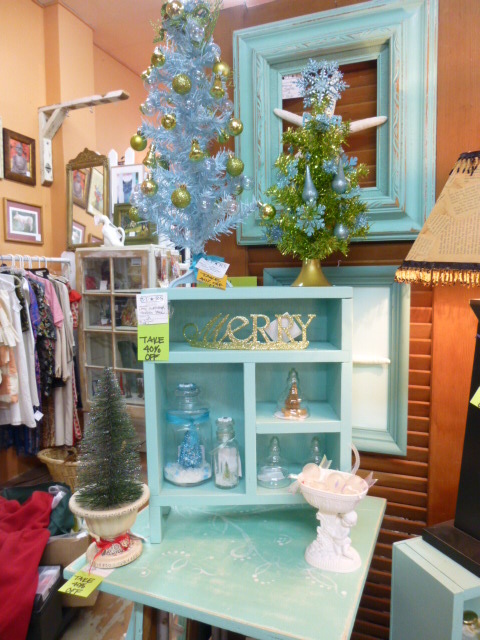 Light blue tree (was white, I spray painted it blue!) 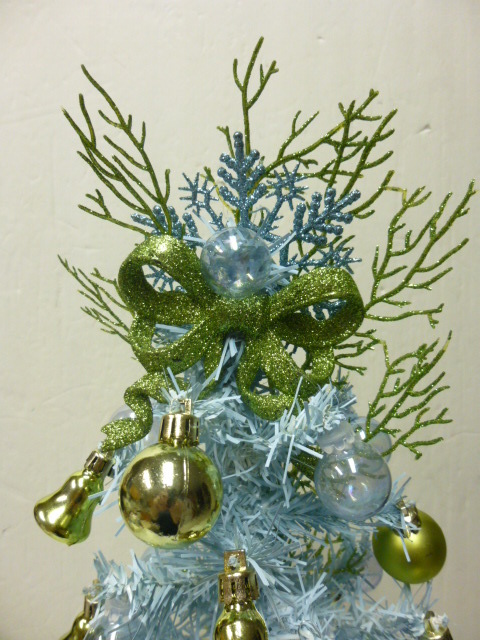 with lime green and clear blue decorations. LOVE how these 2 trees look side by side! Sure wish I had a third tree to round out the grouping! 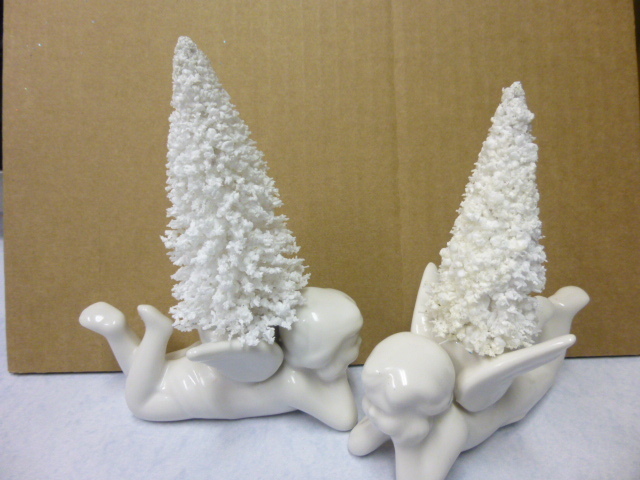 Little cherub candle holders in the front. Took the bases off some little flocked white bottle brush trees, added a bit more glue to the candle hole and inserted the trees into the compressed styro. 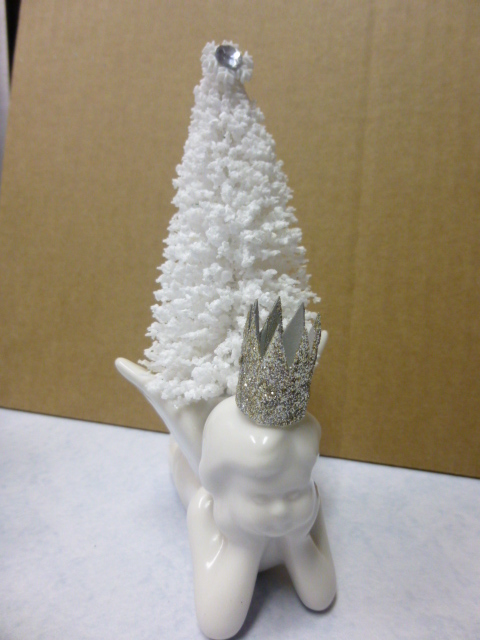 A snowflake and gem for the top of the tree, and a crown for the cherub OF COURSE! Better shot of the white tree tops. One for sale and Stars and one for my etsy shop. 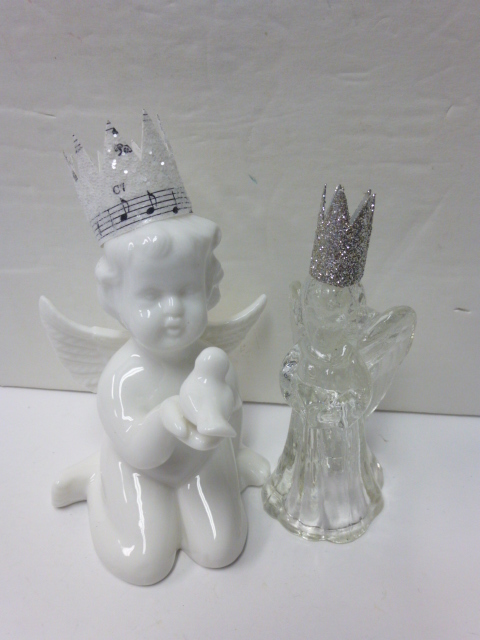 Sweet white cherub with little bird and little crystal angel mini candle holder; just add crowns! 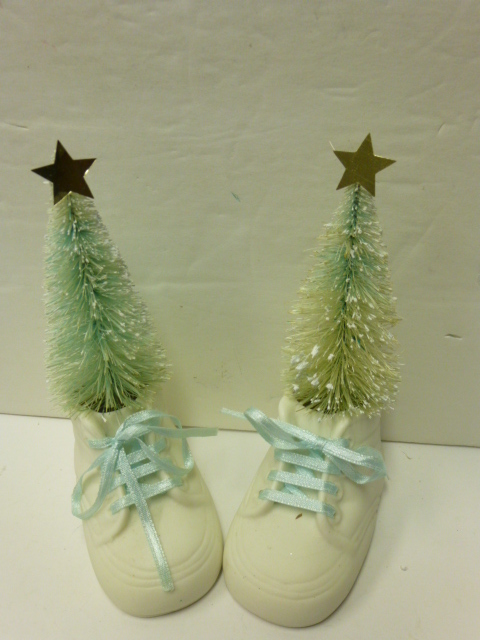 Vintage porcelain baby shoes and bleached green bottle brush trees. Stuffed the shoes with the soft popcorn styro peanuts and glue like the previous project. 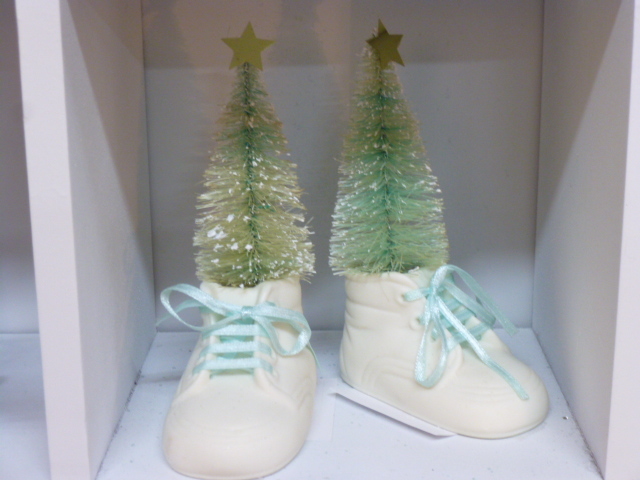 removed the base from the tree and glued and screwed it into the styro in the shoe. Little stars on top are the perfect finishing touch! 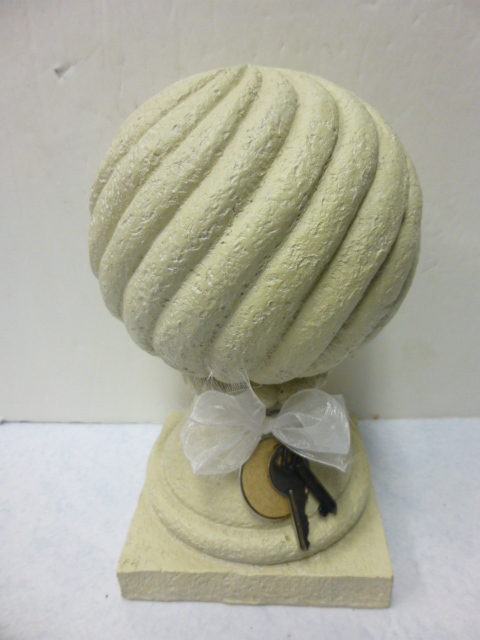 Thrifted finial with added embellishments. 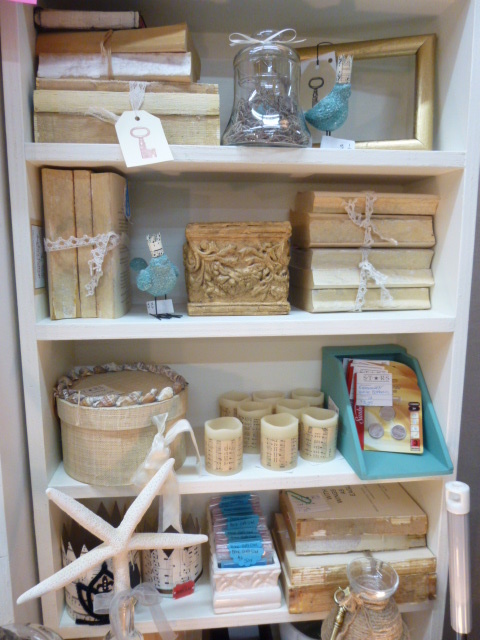 LOTS of new goodies just stocked at Stars . 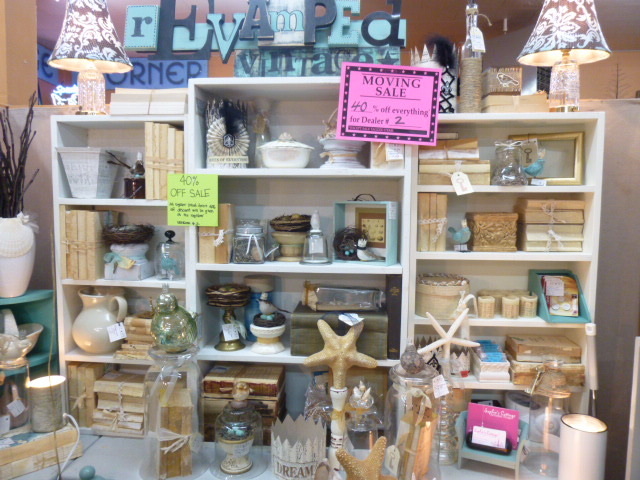 . . and even the NEW STOCK is 40% off!!! Spent FIVE hours at Stars yesterday. First had to tidy up both booths. 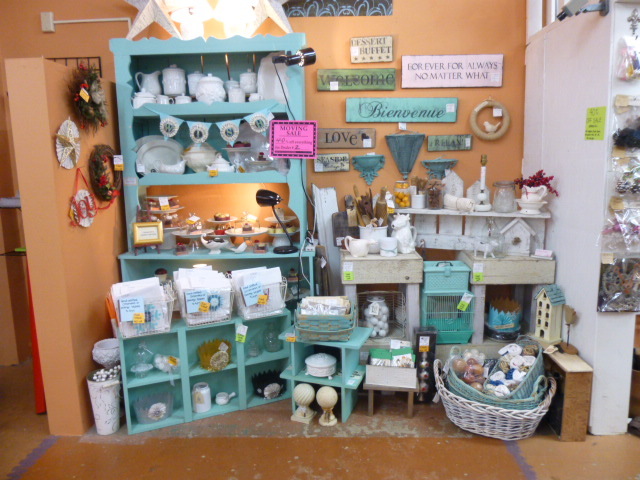 I could TELL I had sold a lot of stuff because of how disheveled my spaces looked. (happy dance!) WAS going to pull a few furniture pieces to make more room for smalls, but MOST of what I had planned to pull had sold! Yippee! So I did some rearranging, pulled some stuff from the back, to the front; and switched others from floor level to eye level. Even IF you don’t have to make room for new inventory, you should move things around, back to front, low to high; EVERY time you visit your space. 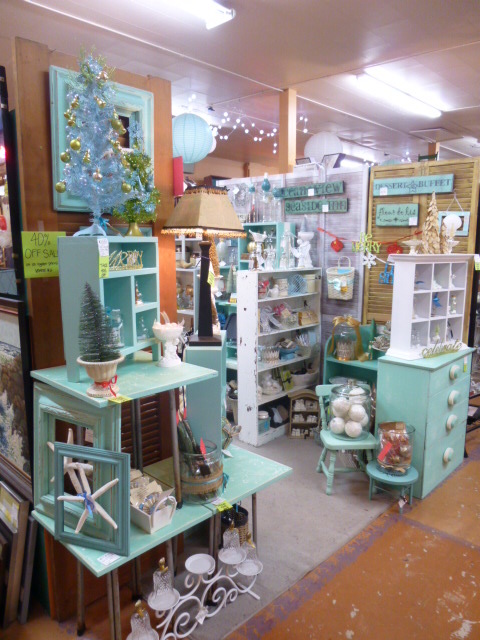 I put most of my new Christmas product at the front of my booth space. 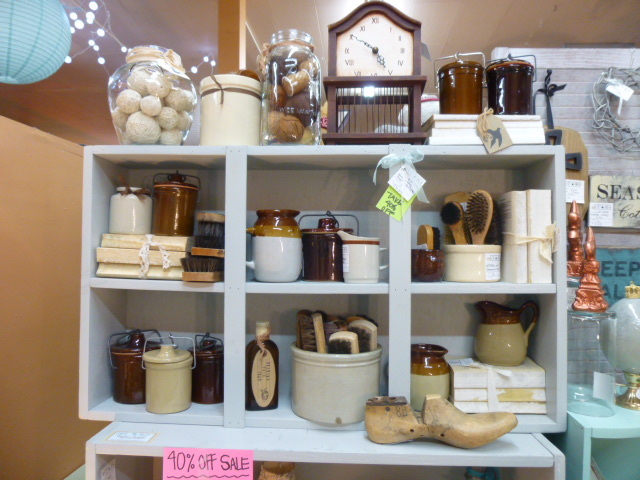 Mostly ‘everyday’ product in the wall space; except for baskets of ornaments. 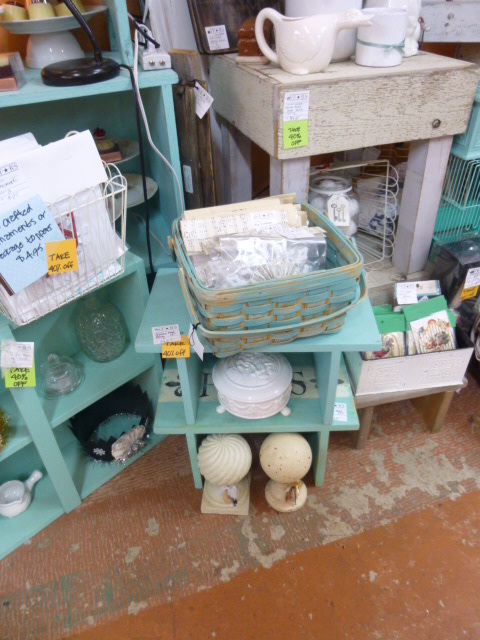 I put the hand made ornaments in wire baskets on top of this cubby shelf so they are right at ‘grabbing level’. Ornaments really sell better NOT packaged. 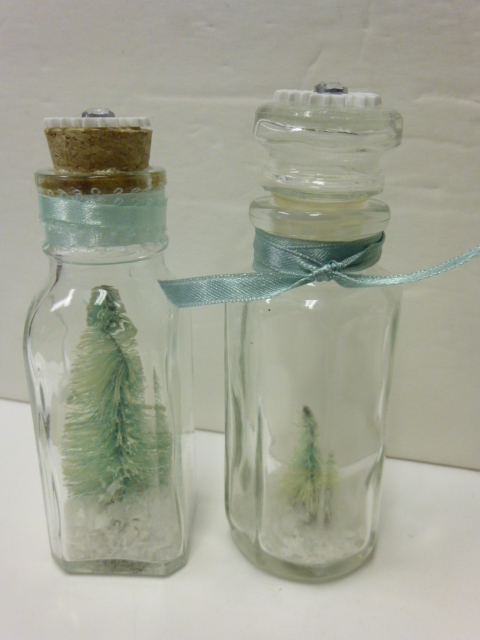 But not packaging them leads to a lot of damage and breakage; so I did package the bigger more breakable ones. 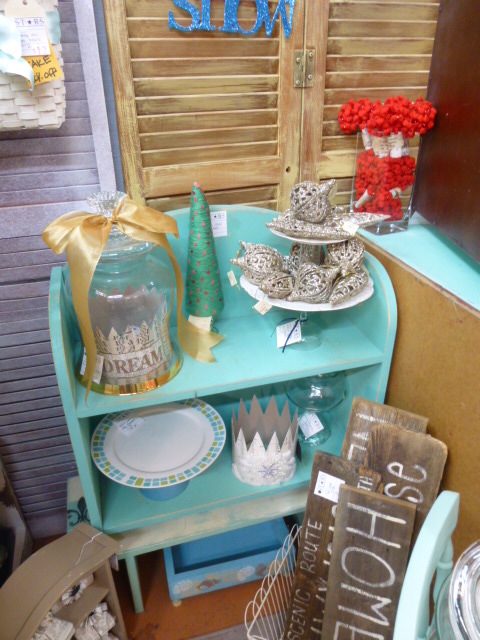 More ornaments in this basket sitting atop two benches. 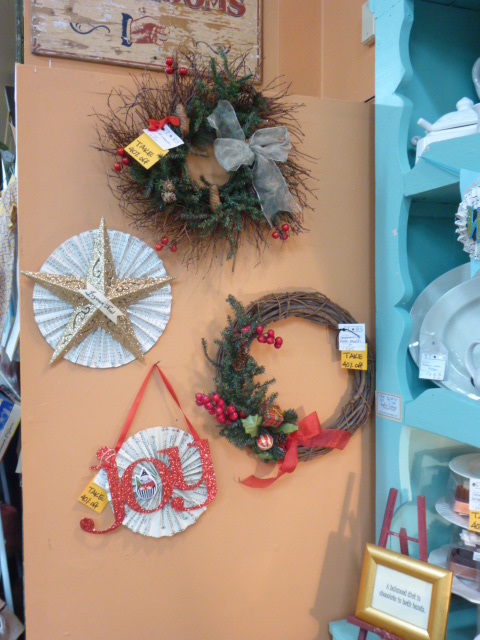 All of these big ornaments are priced at $4.95. With the 40% discount they are just $3.00!!! 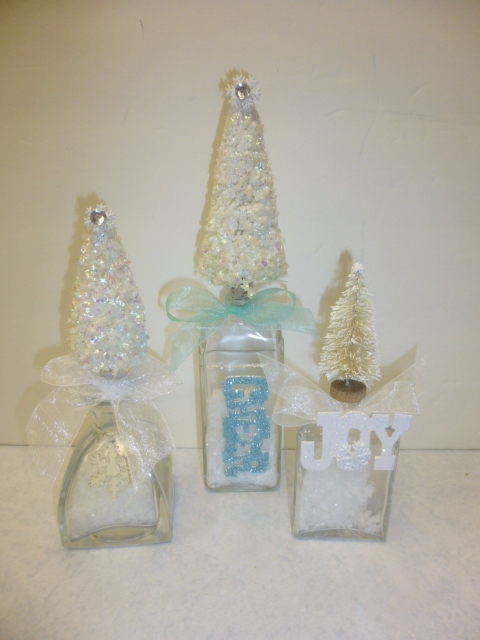 Perfect for a ‘little gift’ that’s ‘not to little’ for co-worker and neighbor gifts. 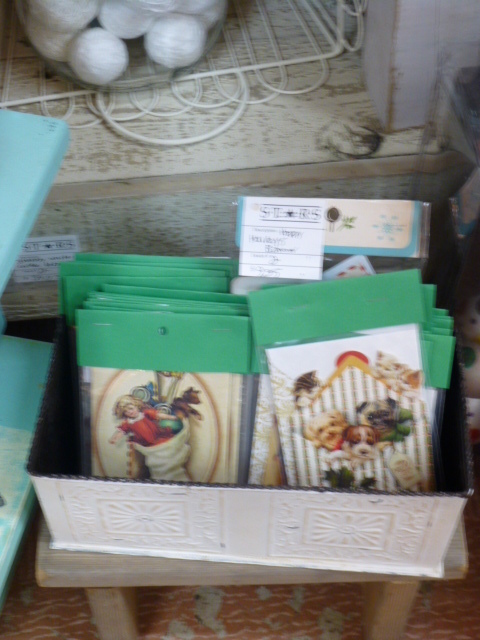 Some really darling vintage repro Christmas post cards and blank note cards. 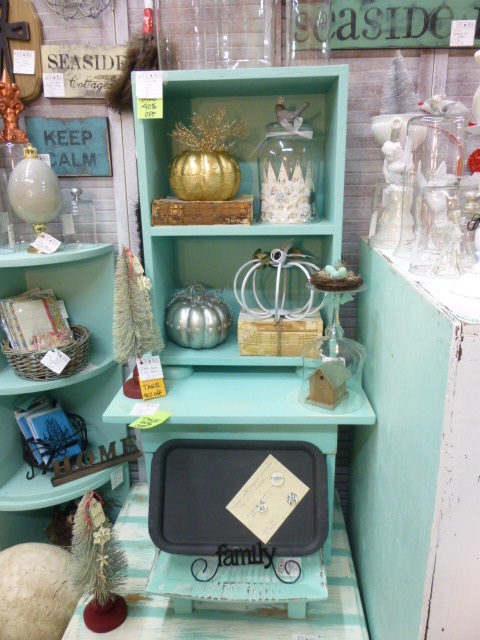 This white cubby shelf was the perfect spot of all my Christmas ‘littles’. Just in case you are wondering why I have time to post on Thanksgiving; it’s because my son is in Hawaii (seriously jealous!!!) with his girlfriend and her parents. So we are having our Thanksgiving on Sunday. 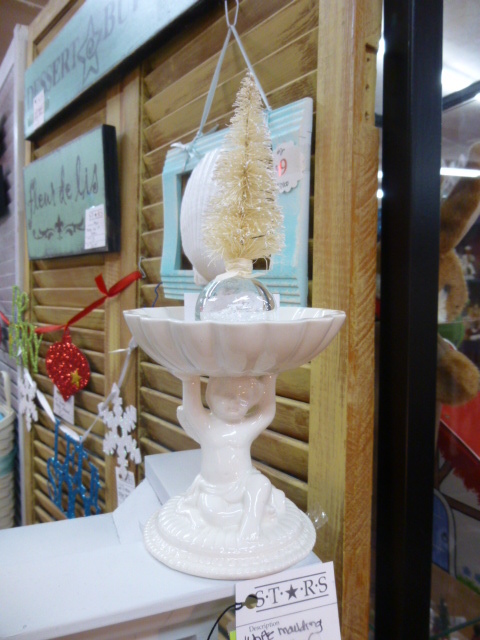 Little soap dishes are cute ornament displays during the holidays! 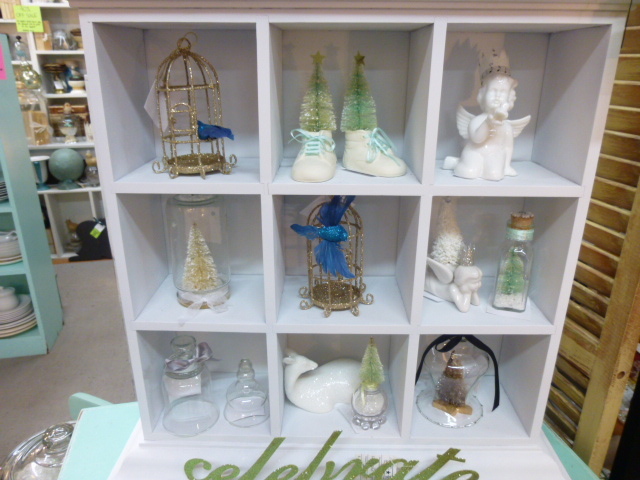 Filled this little shelf with Christmas too. 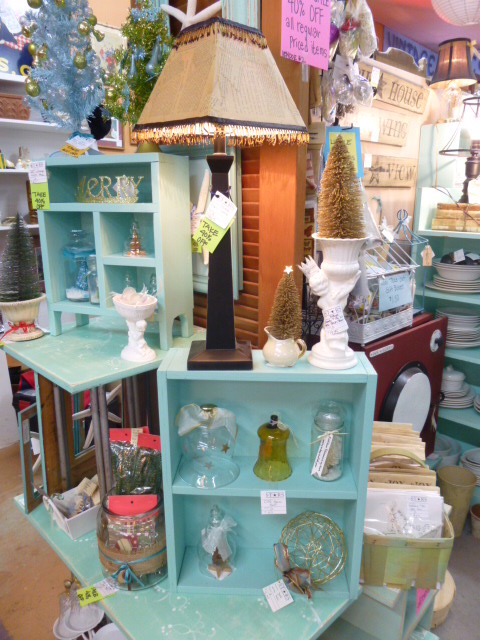 Mini table top trees on top in fun colors! 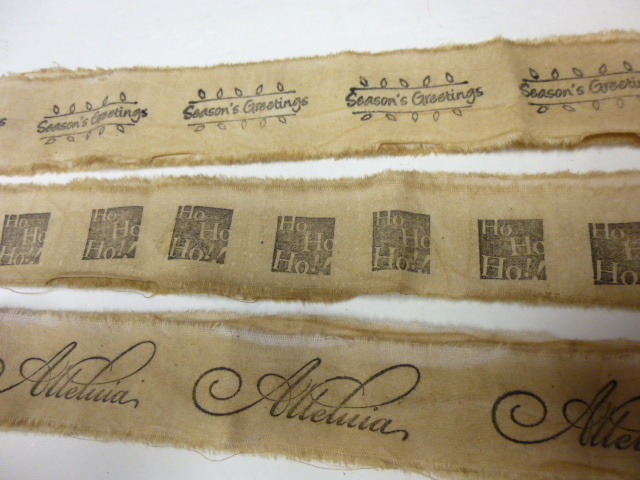 Several different kinds of tea stained hand stamped muslin ribbon. 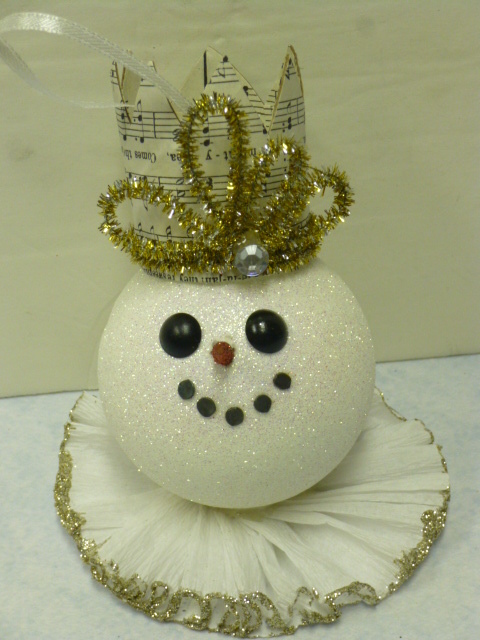 Use it to wrap packages, make bows for decorating or as garland on your tree! 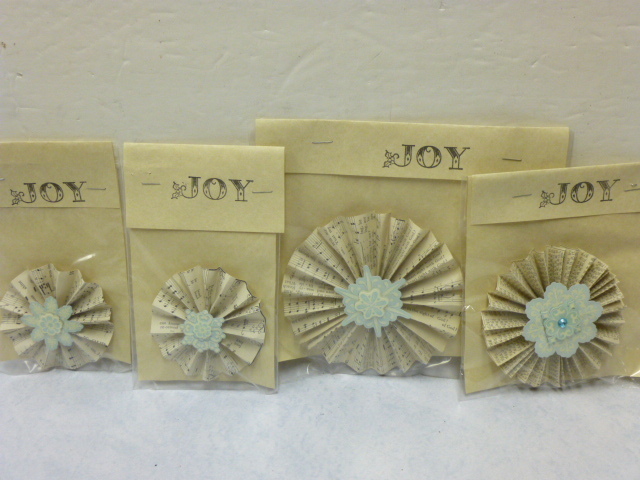 Vintage paper rosettes to pretty up packages or use as ornaments. 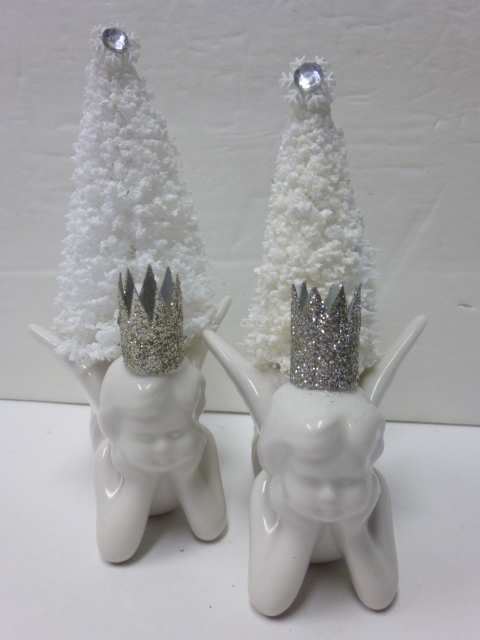 Hand crafted Snow Queen ornaments. Oh so Shabby tea stained bottle brush trees. These are the ONLY ones like this on etsy! 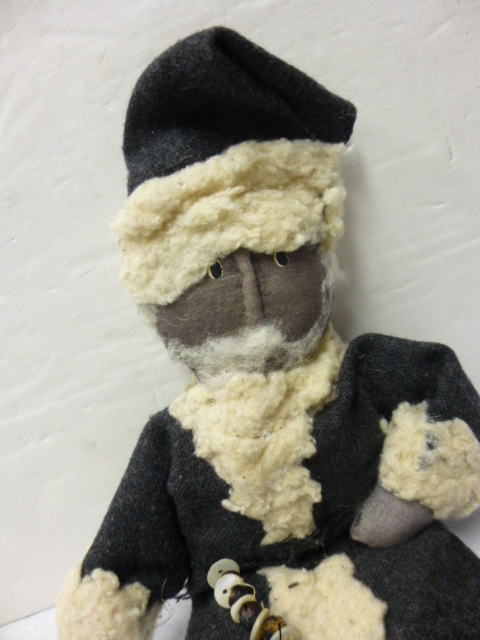 And of course these are lots of great GIFT items in my etsy shop. I’m happy to ship purchases directly to the recipient and will enclose a complimentary gift card. Check back often because I’ll be adding MORE product every few days!